Let our experts plan your personalized, private tour of enchanting Indonesia. Which of the 17,500 islands in the sun should you go to on your Indonesia holiday? Bali never gets old. Its beach resorts and spas combine modern amenities with cultural heritage. It has both lively restaurants and a calm spiritual scene. The Gili Islands nearby are exactly the kind of place the phrase “tropical paradise” was coined for. Further north, in the dreamy Raja Ampat archipelago you’ll find the richest variety of marine life and corals in the world. When the choices are this staggering, it’s time to bring in the Enchanting Travels experts. Let them help you set up an island-hopping itinerary that perfectly matches your needs and expectations. 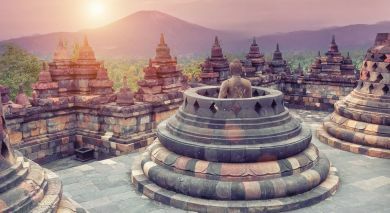 After a few days of relaxing and wellness treatments, perhaps you’d like to hop over to Central Java and visit Borobudur, the world’s largest Buddhist temple. In Kalimantan, within the tropical rainforests of Indonesian Borneo, the last of the world’s orangutans live. Visit these endangered primates in their natural habitat in specially organized tours into the wild. Satays and snorkeling. Batiks and beachfront living. Baskets loaded with sumptuous tropical goodness. Pinisi boat rides and friendly local hosts. Book into pure bliss. The climate of Indonesia is unlike other Asian countries. Here is an overview from our destination experts about when to go to this country of 1000 islands. Fiery volcanoes, magnificent temples and beautiful beaches – Indonesia is full of treasures. Follow this link to discover the top highlights, activities and attractions. 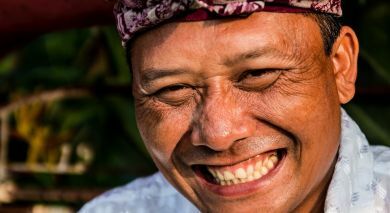 The people of Indonesia are welcoming and friendly, and there is also a social etiquette at play that is often invisible. 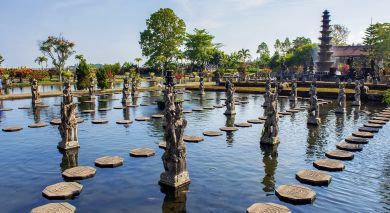 We provide our top tips for one of our Indonesia tours. Like most other Southeast Asian countries, Indonesia is considered a safe travel destination. Bali especially, is extremely safe as a popular holiday destination. Relying on your common sense and following a few safety rules will go a long way in ensuring that your vacation is stress-free. The culture of Indonesia is varied, with its melting pot of colonial and immigrant influences as well as its indigenous traditions, from the Portuguese traders to the Dutch colonialists to Chinese, Indian and Malay settlers. Most people in Indonesia define themselves by their local culture, rather than their national culture. This island state has been a major hub for trading since ancient times, as it is centrally located among history’s superpowers, which is why you can expect to witness all the world’s major religions living harmoniously side by side. Indonesian culture is focused around the community, with a hierarchical structure. Indonesians believe in the concept of gotong royong (mutual assistance) and mufakat (consensus), and the national motto is Bhinneka Tunggal Ika (Unity in diversity). Jam Karet (rubber time) highlights the cultural attitude: that life should not be rushed – everything has its time and place. Indonesia has a standardised dialect of the Malay language, known as Bahasa Indonesian, which was declared as the official language of Indonesia during the nation’s independence in 1945. However, due to the numerous islands, most people tend to speak the regional dialects of their island or community, such as Javanese (from Java), Balinese (from Bali) and Minangkabau (from western Sumatra). Indonesia is the largest nation with people following the Islamic faith in the world, with 88% of the population being Muslim. In addition, Hinduism, Buddhism, Confucianism, and Christianity are all practised and prevalent within Indonesia. Generally, all the religions get on and follow the mottos of ‘Judge not, lest ye be judged’ and ‘Do unto others as you would do to yourself’. There are also still many ethnic peoples who practice their indigenous customs, wear traditional dress, and often believe in animism. Animists believe that the gods inhabit the mountains, especially Bali’s tallest mountain, the stratovolcano Mount Agung. Due to the diversity, you can see religions that have been fused with different influences, and you can witness this during the many colorful religious festivals, which play a major part in the culture of Indonesia. Indonesia is rich in the arts, with something for everyone. One of the most unique events you can enjoy as a visitor to Indonesia is Wayang, the shadow puppet theater or dance shows, which intricately crafts together mythological legends with traditional performing arts. Dance in Indonesia plays a major role in the culture, and many performers have usually been practicing under the guidance of an expert since childhood. The dance style is very expressive, precise, and often somewhat surprising. There are over 3,000 Indonesian original dances, sometimes with tribal roots. Bali is the ideal location if you wish to witness cultural dances first-hand when you travel in Indonesia. The dance dramas of Bali are intertwined with Buddhist and Hindu mythology from the Ramayana and Mahabharata. The Barong & Rangda’s dance of good over evil is probably the most famous of the Balinese Hindu dances, depicting demon queens and child eaters, while the Legong dance is considered the most graceful. A masked dance, known as Topeng, brings to life the Balinese language, while chronicling the island’s history or social issues in a comical way. Silat, is a self-defense martial arts that was developed in the islands of Java and Sumatra, which has been shaped by the tribal wars of Indonesia’s ancient history, and also by proponents of independence during the Dutch colonial rule. Tarung Derajat is a modern street fighter style of combat. The martial art form of Pencak Silat interweaves traditional art, music and sport. The music of Indonesia is also varied and it is well worth taking time out to enjoy a performance or two during your tour of Indonesia. When visiting Java in 1580, Sir Frances Drake was mesmerized by the exotic music with its metallic timbre. Gamelan, used in East Java and Bali, is a popular traditional instrument ensemble, that includes bronze percussion instruments, such as metal pots, gongs and drums. Kroncong music dates back to the 16th century when Portuguese sailors brought their native instruments to Indonesia, and is a melodic ensemble of string instruments, (including the kroncong, which is similar to a ukulele), a flute and a female vocalist. Songs tend to be melancholic and of love and natural beauty. Sasando music from West Timor is a soft style of music, which uses a lead that provides a timbre similar to a harp. Native to West Java, angklung music has become known globally due to its traditional bamboo angklung instrument, receiving UNESCO status. In modern times, the Bollywood culture of India has also had an influence on the nation’s music. Indonesia is home to an array of traditional sports, from Balinese cockfighting to the annual bull races in Madura, to stone jumping that was used to train warriors, and sepak takraw, a game similar to volleyball. Indonesia has always had a history of arts, with influence from as far back as the stone age. You can see some of the best examples in the many temples of its islands, and its architecture,including traditional timber structures that are built on stilts. You can find a presence of animist traditions and tribal art in most of the nation’s crafts, as well as styles with strong Hindu and Buddhist roots. In Java, you can experience many types of craft – from canvas art to wood carving, handmade, intricate silverwork, clay and stone sculpture. The island also is a major center for batik, ikat and songket cloth, all of which originate from Indonesia. In Sumatra, you can witness excellent examples of Islamic art and architecture. In Bali and Java, you can see the wayang kulit, the shadow puppets, made of buffalo hide and then painted. The cuisine of Indonesia is simply delicious and well worth exploring during your private tour of Indonesia, especially if you like exotic, fragrant flavors! 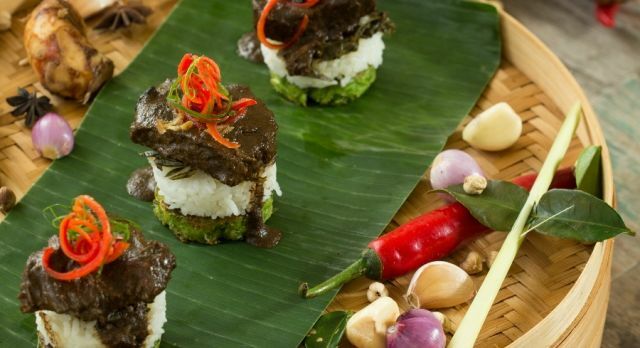 There are about 30 dishes considered most important to the cuisine culture of Indonesia, however it is thought there are over 5,000 traditional dishes. The regional variation of food is wide, but most meals consist of two main dishes, often meat or fish (known as lauk) of some variety and vegetables (known as sayur), and often a broth or soup, The main dishes are often served in a traditional way, such as banana wrapped, or with a vegetable salad. Meals are usually served with noodles or steamed rice, however starchy tubers (like yam, taro, cassava, potato and sweet potato), sago and grains (maize) are also served. The cuisine capital of Indonesia is Jakarta, which has unique flavors from across all the nation’s islands. Tumpeng: The official national dish, this is a cone-shaped dish made of rice, made using a bamboo container and served at all special occasions. Nasi goreng: The unofficial national dish, this is fried rice made with kecap (or ketchup), a sweet and thick soy sauce, and garnished with pickles. Sambal: a condiment made from chilli, fermented shrimp paste, lime, sugar and salt and an accompaniment of most meals. Satay or sate: Chicken, goat, mutton and even rabbit meat skewers that have been marinated in turmeric, cooked over hot coals and served with yummy peanut sauce. You can find sate madura, in the boat-shaped street carts, which comes served with ketupat (rice cakes), onion and cucumber. Nasi padang: A curry that often includes floating fish heads or cow’s feet – this is not for the faint hearted! Martabak: A spongy, fatty and thick crepe, filled with chocolate, peanuts or cheese, and often served with a pickle! Daun pepaya: Sauteed bitter greens, made with papaya leaves. Gorengan: Fried snack food that is popular in streets across the archipelago, from vegetable fritters and fermented soybean cakes to fried bananas! Bakmie goreng: A carb-friendly noodle dish of varying types. The contemporary healthy version is to make vegetable noodles from beetroot or spinach! Gudeg: The signature dish of regal Yogyakarta, this is a jackfruit stew that has been boiled for hours in coconut milk and served with spice and savory items like rice, egg, and chicken. Bumbu Bali: Bumbu means seasoning and this is a popular dish in Bali for serving fish, particularly mackerel. 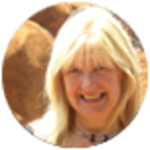 Always allow your hosts or the restaurant to seat you – as hierarchy is an important part of the culture and you have guest status! It is not unusual for food to be shared from one main dish in the middle of the table. Allow your hosts or waiters to serve you first, as it is considered rude to help yourself to the first helping. It is normal for men to be served before women – don’t insist otherwise. If in a buffet style of eating you are invited to eat first, insist your hosts eat first as this is considered polite practice, but know that you will receive the first bite! Food should only be passed with your right hand. Cutlery vs hands? Depending on the establishment, you may be expected to eat with your hands or with cutlery. If in doubt, wait to see what other diners do. Your tour of Indonesia brings ancient history to life! Discover the lush green landscape of the strategically located archipelago, which has drawn in travelers for centuries. Nearly 40,000 years ago, the first settlers crossed over land that bridged the islands to Asia at that time. Over time, with rising sea levels, this link was permanently severed, but by that time the first hunter-gatherers were already well settled into a life of farming. 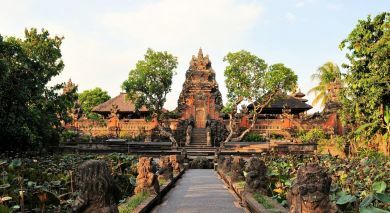 For the next several hundred years, trade between Indonesia and other Asian countries flourished, while Hinduism and Buddhism took root among the people. From the 7th century onward, several powerful kingdoms rose and fell, not least among them being the Srivijayas, the Sailendras and the Mataram dynasties. In the meantime, more and more merchants began to arrive, thrilled at the prospect of Indonesia’s abundant natural resources, and bringing Islamic influences with them. Throughout the years, one dominant and powerful kingdom stood out – the Hindu Majapahit Empire who held sway between the 13th and 15th centuries. 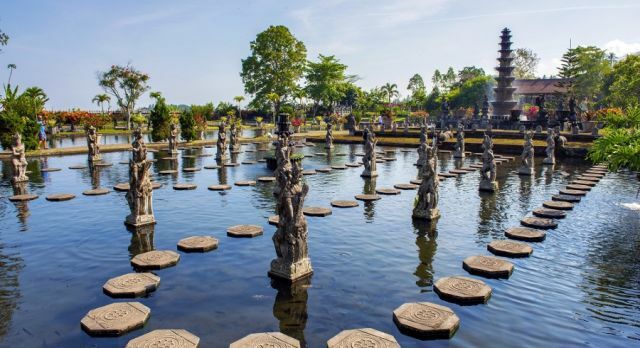 Till date, the dynasty is remembered for their love of art and literature, and during your Indonesia tour, you will see several existing monuments from the era. In the 16th century, unable to resist the allure of Indonesian spices such as pepper, mace, nutmeg and cloves, the Portuguese arrived to take charge of trade and commerce. This was a dark time in the history of the native Indonesian people, as years of colonial dominance brought exploitation. Also looking to colonize, Dutch explorers managed to wrangle power from their Portuguese counterparts. In the 17th century, the British joined in the ruling game, and tried to establish trade, but were thwarted by Dutch forces. In the early 18th century, the Dutch government officially took over the administration of Indonesia, despite some local rebellions. The Dutch introduced several social and economic measures during the 20th century. However, amid nationwide uproar against the Dutch colonialists, educated Indonesians began to demand independence. During World War II, Indonesia was occupied by Japanese forces, who eventually ruled in favor of an independent nation. The Dutch, however, were reluctant to give up control. Eventually, after many years of resistance, guerrilla warfare, and international condemnation, Indonesia became independent in 1949. The country’s challenges did not magically disappear – the next 50 years brought separatist politics, rapid inflation, a communist coup and a dictatorship. It was only at the beginning of the 21st century that the country finally began to recover under the leadership of President Susilo Bambang Yudhoyono. Today, the archipelago is a flourishing nation of diverse people. 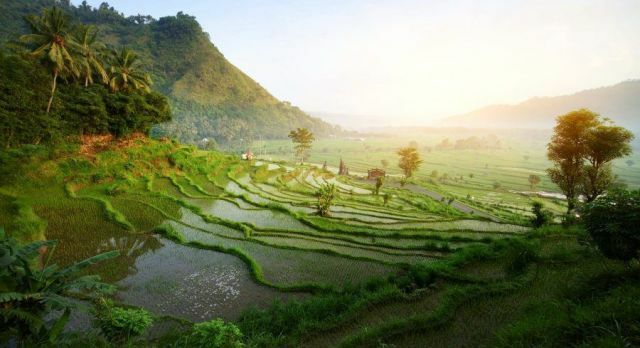 Experience a private Indonesia tour for yourself and be introduced to this incredible country, which has retained its resilient spirit and optimism for centuries.